I must admit I never thought it possible that someone could be a bad influence on Ivar. Oh, she most definitely is. S5E13 was pretty good overall, though I did zone out during one of the Iceland based discussions. I'm still unclear what Bjorn and the others will do for Alfred. Other than Bjorn impregnating his wife. Perhaps they will appear before a battle and get that Viking who was running York on his side, along with his troops. I wondered about that too. As much as the Northmen are symbols of ferocious fighting, they are not exactly adored by the Wessexians (Wessexish?). The Viking-in-Charge of York was initially undecided about joining Good King Finehair in attacking Wessex. It would be sweet if he switched sides in mid-battle. To be honest I am not enjoying the way they have completely changed the historical setting in Wessex. I do not mind a bit of poetic licence and all that however this seems a bit too much. A fair point, especially considering this is on the History channel! Ivar has lost last of his marbles. I'm not sure he started with many, but AllFather cannot be pleased with this travesty, taking in that he seeded the child. It doesn't surprise me that his brother resents him. It's no wonder why so many Vikings turned to Christianity at the end. The Old Gods just were too bloody. I really liked Peter Frazen digging into all that dark stuff that comes from being Finn and applying it to being King Harald, without his wife. But I loathed Floki meeting with a ghost and driving the Icelandic community deeper into the darkness. It's just all the stuff that they are going through makes me also think is it going to the same stuff for the planetary colonisers? After all they're going to be humans and the bloody, murderous package that is the history is going to move over there with them. I hope it's not going to be repeating things again and again. We should learn and the History channel isn't afraid of showing how cruel the colonisation was back in the day. A much better episode. Ivar is stark, raving bonkers. I do find myself comparing the depiction of Alfred in Vikings against David Dawsen's Alfred in The Last Kingdom unfavourably. I didn't think this episode was strong either. By the second half of season 5 of a show you have to expect some drop in consistent quality. Ivar has changed from someone quite intelligent, in a ruthless way, to someone deluded who thinks he can suddenly tell people not to believe their eyes. Without showing much of why. Well I suppose love/lust can turn people crazy. The sacrificial ceremony reminded me of something from "Live and Let Die". But it seems we will be building up to another big battle before the end of the season. Wondering if the Iceland story will go somewhere. Presumably they will eventually get a functioning colony and then go back and recruit some more folks? The Harold finehair scene with the potential love interest was amusing. Wondering if the Iceland story will go somewhere. Presumably they will eventually get a functioning colony and then go back and recruit some more folks? What troubles me with the Iceland community is that Iceland used to have woods. They had a lot of stuff there that they could have used, but living at top of the world means that you have to live with very short summer and rest of the time with constant winter and darkness. I understand the current pessimism if they would be doing it at winter times, but not if they're moping around the end of the summer. To be honest Vikings knew how to live in hard places. They knew how to build settlements, live off the land and navigate the world. There are those accounts, where the Icelanding Vikings made it off to coast of Canada, where they made the settlements and lived with the nature until the natives wiped them off. Floki is a carpenter and a master boat builder. The current state of their village is awful. Why is that he isn't able to make better settlement for them all? It's very likely that the expelled people might come back at deep of night. So without defences it's going to be easy thing. But yeah, Floki should definitely start transporting sheeps, yaks and supplies from Norway back to Iceland if he's going to be stay in the Iceland forever. I thought that everyone regarded the Seer as an untouchable holy man. As it turned out, not so much. Ivar wasn't the first character to get bad news from the Seer. He is the only character so stark, raving mad that he thought nothing of putting an ax through the the Seer's eye. Not sure if it was his "good" eye. Other than Ivar's bloody work with the sacrifice and Seer, this episode didn't offer much in the way of action. Hvikserk's feeling that he needs to hang around his hometown for some unknown reason had better resolve itself into overthrowing Ivar before his crazy brother adds him to his list of victims. I still can't get terribly interested in the pale intrigues of Wessex and Iceland. 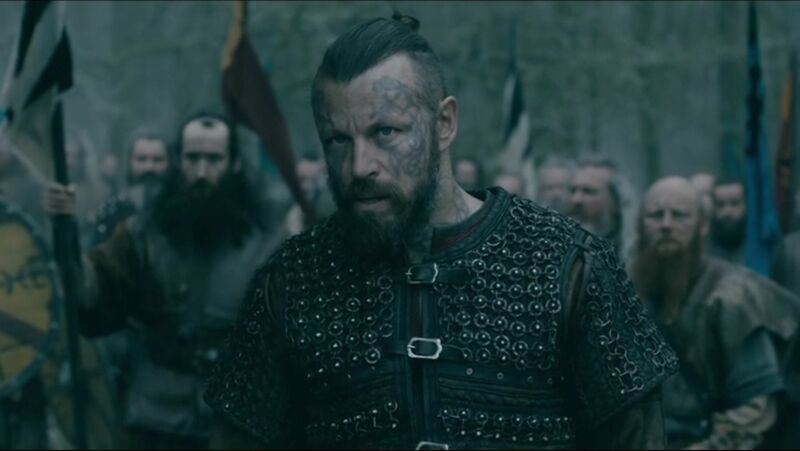 At least the arrival of King Harald promises some action in Wessex. I was wondering how true The History Channel was going to stay for the actual history as the Alfred vs the Vikings battle loomed in the horizon. Thing is, it is spoilerific to know that Alfred lived to become names as Alfred the Great later in the day, especially as we have seen how weak and bad Alfred was before the battle. In the show he is not the great warrior, but actually a lightweight man, who can barely lift a sword in his hand. King Harald and his followers in the other hand has showed remarkable robustness and strength, but typical to them was that they were too stubborn to choose their own battles. A lot of them were shouting: "Why the ground is burned?" when they faced head-to-head Alfred's army, supported by catapults, and cavalry. Not that the cavalry made any difference after they revealed the kettling tactic by surrounding the opponent inside walls of fire. But a wise leader would have chosen another battleground and not charged head first to an ambush. I am glad that King Harald has plot armour and he was saved, while we lost Edmund and Lagatha. I also hope that he has enough of wisdom to Denmark to organise even bigger party, or aim his adventures to elsewhere in Europe and Asia. Historically we know that thousand boat parties started to appear soon after the defeat in the Wessex. But it was too late for them and it didn't take long before Vikings were forgotten as most of them turned to Christianity to only join the Crusades going back to the Holy Land. In a way nothing changed. But seeing how Ivar defined the end of the AllFather by declaring himself as a god just tells that the Raknarok for the Viking were coming nearer. He should have not killed the Seer, but he did. He also declared that his baby was going to be a boy. What if it's a girl? What is he going to tell the people then? It's just that the lies can lost only so long, and if you try to maintain them while the truth is clear as day, you are going to feel as big jerk when the lies doesn't support you any more. Luckily Ivar isn't stupid as he understands the power of preaching his own gospel. The people eat propaganda and they support it if they know no better. At the end it's nothing more than a house of cards and you know how it goes, if one the supports is removed. I am predicting that Ivar is going to face a disaster pretty soon. Then we are going to see how much people supports his ideas. I can't complain about the action this round. I have the benefit of historical ignorance, so I was surprised that the bishop fell and that his king survived. Heahmund seemed as invincible as Bjorn, while Alfred was still in his early sword training lessons and had no business being on a battlefield. Alfred would have been among the dead if his half-brother had not had his back, I wonder if that will count, now that Alfred knows of his involvement in the assassination conspiracy. The statue erected in Ivar's honor was perfect cartoonish reflection of the new god. Both should be pulled down soon. I don't believe that Lagertha has joined Ragnar in Valhalla. She should be more valuable alive than dead. I'm applying the old TV rule: no body, no death. 5 e15 was a lot more fun than the previous couple. Entertaining. The death of Bishop Egbert was a shock but no man survives long after turning from her love. Almost like a curse. The burning of the ground left a flat battle ground. Probably only really of benefit for the few catapults unless there was a worry they would fight where horse can’t charge. Ivar and his brother Hvitserk will surely fight before the season ends. With the burial of the Seer the actor can no longer phone in a Vikings paycheck! There was no Iceland story today, which helped the episode flow. Alfred's brother won't last long. Mom is a little too calculating for that. Ivar won't survive the series either. The actual historical facts surroundng him are sufficiently vague to provide a tabula rasa. I used to enjoy eating at a place in Seattle called "Ivar's Acres Of Clams".Wonder how they're doing. "What kind of mother are you?" Well, Judith is the kind of mother who who clearly favored Alfred's right to the Wessex throne. She's the kind of mother who enjoyed pulling the stings of power behind the scenes. She's the kind of mother a son should never, never attempt to put in her place. She's the kind of mother who should be required to taste your food at every family dinner. Yeah and it wasn't first time she had poisoned someone in her family. When Ragnar was alive, she did the same thing. I just didn't guess that she were going to dirty her hands, when Mummy Dearest was so concerned over Alfred having epileptic fit. Except they showed him being almost paralysed. Completely knocked out. Too bad that in the real life it'll reset your brain and you will have problems on adjusting back to the reality. The blessing is that you won't remember anything. But I don't think they're going to show Alfred in the state, where he cannot function, because he still have to face those Saxon's to unite the kingdom. But all that Mum has been doing points out to that the Royalties need to establish the Tower at banks of Londonium. After all that was the place, where you'd end if you were a royalties and your head was on the block. If you'll go to visit it today, the Yeoman will tell you that last execution was just back in the 1800's. A little over hundred years ago. Before that at least 700 hundred years of murders and plots to get to the throne. It surprised me that the Vikings currently looks like Game of Thrones, except in this one there aren't only one, but many. And their owners keeps rabidly changing. The other surprise was the appearance of the Buddha in this episode. In China, there are caves that have mummified corpses, with definite scandinavian features, like blond hair and broad shoulders. So, it is very likely that we ventured farther than Damascus in pursuit for knowledge. It wasn't just North West, Iceland, Greenland and ultimate Canada. Some of the Vikings were great explorers as they weren't scared of going into the strange lands or meeting with people, who clearly weren't theirs. Thing is, the Buddha that appeared seemed to be like the Buddha in real life. There are tales that say the Buddha was as real as all Hindu Gods. It is just a surprise to think that a Mongolian looking man could be found from Kattagat. Yet, you only have to look into Russia and Ural Mountains and these features start to appear. If, Buddha is the same as the AllFather appearing as Wanderer it is also another nod towards the mythology becoming reality in this series. But so far I have not written a word about Hagard even though Peter Franzen got titled as first in the series. I think he has more plot armour then Ivar at the moment, but it is interesting that he willingly accepted Björn's and Brunhilda's newly forged relationship. It's just can that Brunhilda be the Brunhilda? Holy cataclysmic climate! This show is not exactly a promotion for the Icelandic Tourism Bureau. This episode covered all the bases -- Norway, Wessex, York and Iceland -- each for a few minutes at a time, at a dizzying, revolving pace. I think Hvitserk is making a mistake in leaving his girlfriend behind as he obeys the eviction notice from his crazy brother. I didn't expect Judith to confess her murder of Aethelred to King Alfred, but it seemed to put her back in charge of the kingdom. Alfred the Great appears to be more of an Alfred the Wimp. 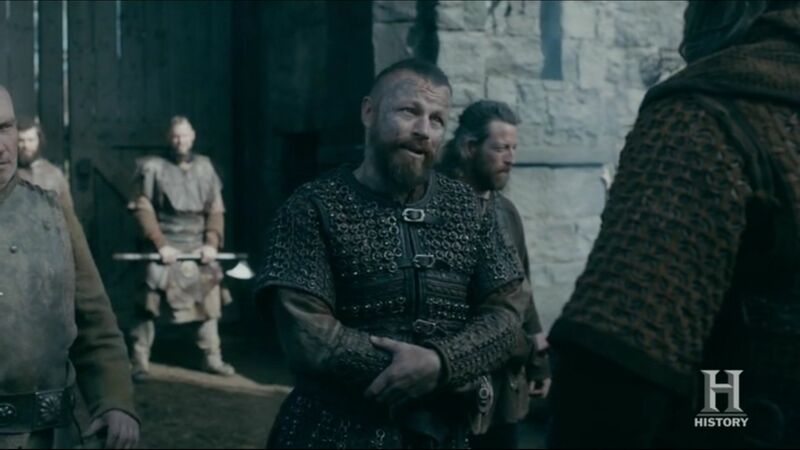 Bjorn appeared to be matching Hvitserk's mistake as he seemingly offered his first confessed love to King Harald in exchange for his help in dethroning Ivar the Bonehead. 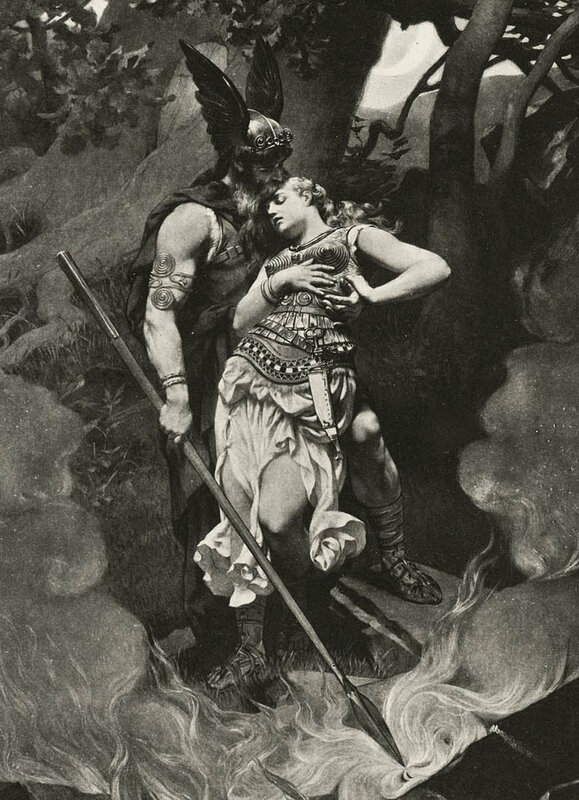 Harald's history of setting his romantic sights on women out of his league seems likely to remain unbroken. The Iceland community seems to consist of a dwindling number of indistinct, heavily animal-skin dressed characters whose hobbies are limited to shivering and killing each other. Floki's vision of paradise it ain't. Much as I have enjoyed the show a lot it has petered out a bit in the second half of season 5. With less strong characters 6 seasons sounds like a good length to finish with. Interested in spinoffs though!